Cranberry Pistachio Oat Bars | Eat. Love. Namaste. 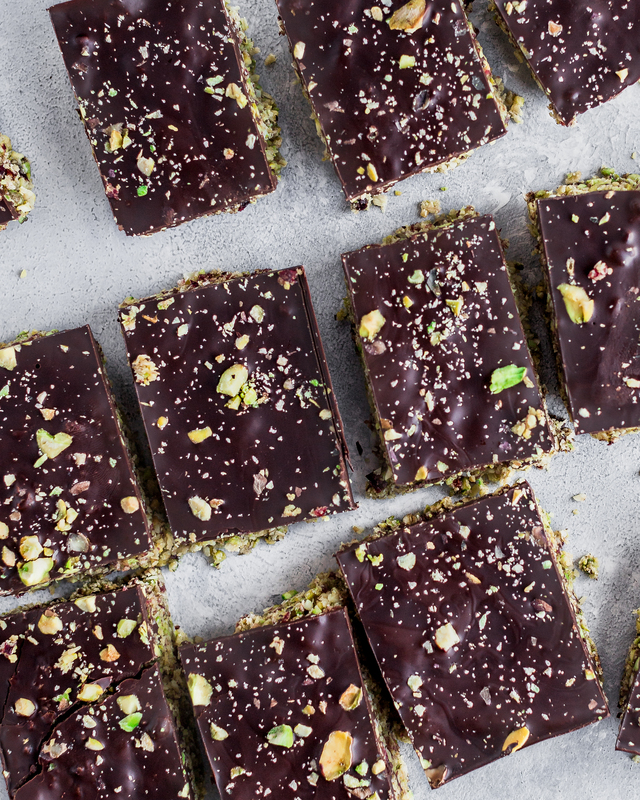 These bars make me happy: they are vegan, slightly sweet, nutty, oaty, and very delicious! They could be enjoyed as part of breakfast, a snack, or even for dessert. 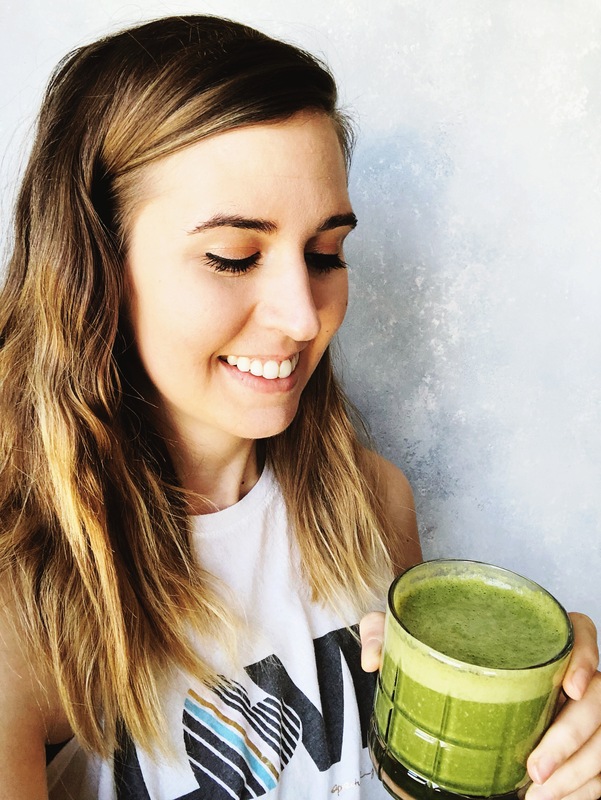 When I made these the first time, I enjoyed one for breakfast, one for an afternoon snack, and then one for dessert – just that good! 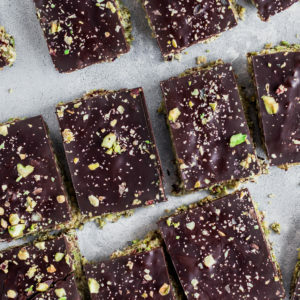 I chose raw, shelled pistachios in this recipe because they are rich in antioxidants and minerals, and have no added salt. The pistachios complement the cranberries very well in this recipe. 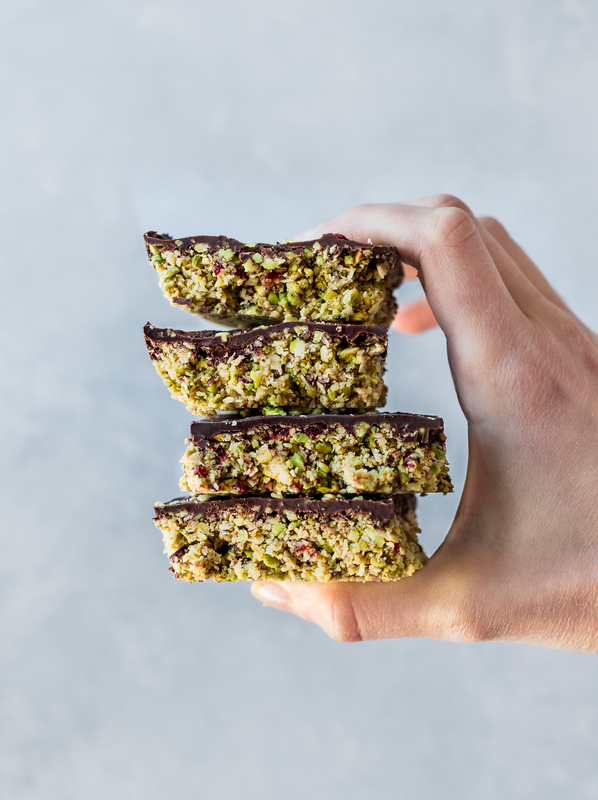 These bars taste great as-is, but if you’re craving more sweetness, add a fun chocolate drizzle or add a layer of chocolate on-top. – Go wild & treat yo’ self. I made these two ways: as bars and as cookies. See notes below if you’re feeling more of a cookie rather than a bar; either way, you will still enjoy these. 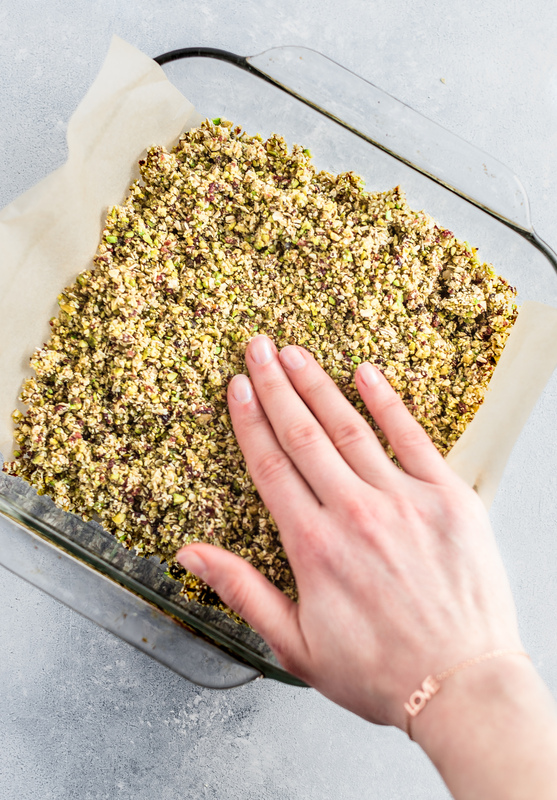 I hope you love these Cranberry Pistachio Oat Bars! They are the perfect treat and a great on-the-go snack! Require 7-ingredients and less than 20-minutes to make! Enjoy! 7-ingredient Cranberry Pistachio Oat Bars made in less than 20-minutes that are slightly sweet, nutty, oaty, and very delicious! Preheat oven to 350 degrees F and line a 9-inch square pan with parchment paper and set aside. 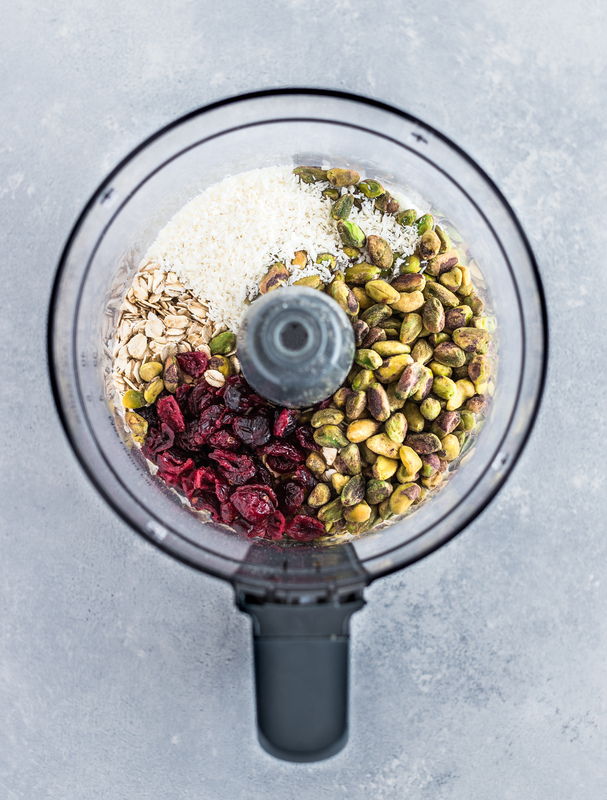 In a food processor with the S blade attached, process the oats, pistachios, cranberries, coconut flakes, and the salt for about 30 seconds, until a meal starts to form. Drizzle in the maple syrup and melted coconut oil while the motor is still running. The meal will begin to come together into a crumbly wet dough. Press the dough evenly into the pan and bake for 12 minutes until slightly golden brown. Let the pan cool completely. 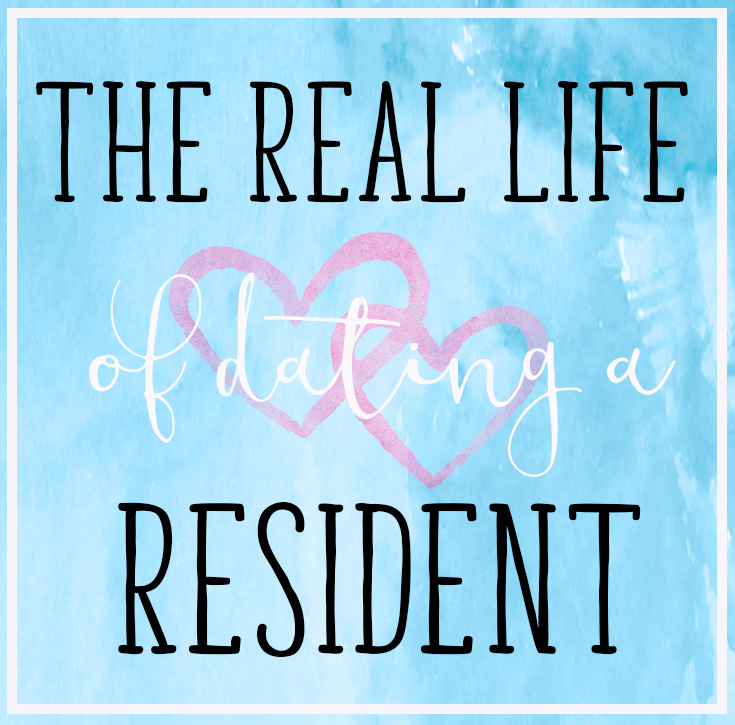 If adding chocolate on top, heat the chopped chocolate and 1 tbsp of coconut oil over a double-boiler, until melted, or in the microwave, mixing in increments. 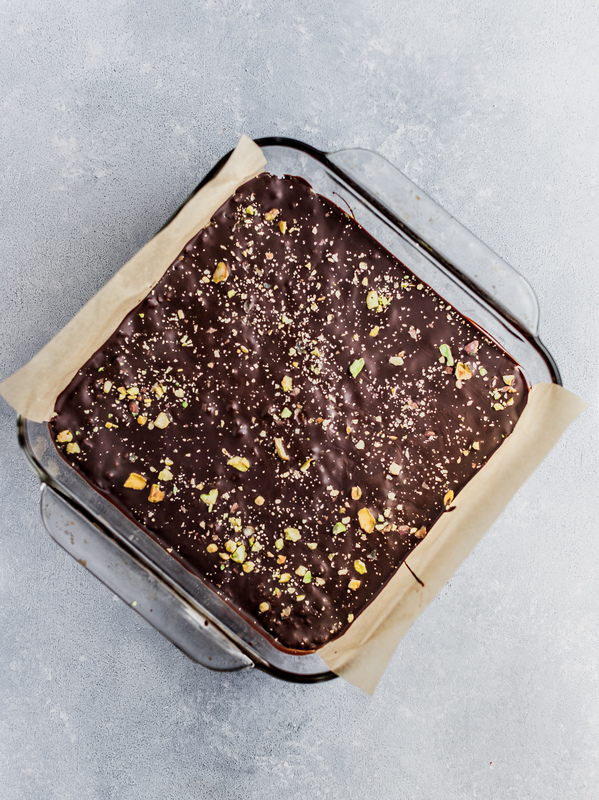 Add melted chocolate on top of the cooled bars and sprinkle crushed pistachios and flaked salt (optional) on top of the melted chocolate layer. Place the bars in the refrigerator for 15-minutes to harden the chocolate. Carefully lift the cooled bars out of the pan by holding two sides of the parchment paper. Cut it into squares and enjoy! If making cookies, scoop 1 tbsp of the mixture and roll into a ball. Bake at the same temperature for 10-12 minutes, or until golden brown. Leftovers stored at room temperature in an airtight container for up to 5-days.